Optional Compressor Time Delay: 30 metres max. 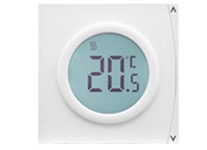 Please ensure there are no large metal objects between the thermostat and reciever as this will interfere with radio signal. Transmitter Frequency: Heat or cool operation, including compressor time delay. Compressor time delay only available if thermostat is set to cool operation.